Winrock sponsors the first official U.S. visit by Cuban farmers in more than 50 years. Yurien Bec Jelis with Cody Hopkins of Falling Sky Farms. Jelis was one of four Cuban farmers on an Agricultural Exchange Tour in Arkansas. Photo by Rett Peek. It would be easy to assume that Cody Hopkins and Yurien Bec Jelis would struggle to find something to talk about. Hopkins is an Arkansas native who taught high school physics in Rhode Island before the pull of his roots drew him south again to rural Searcy County. 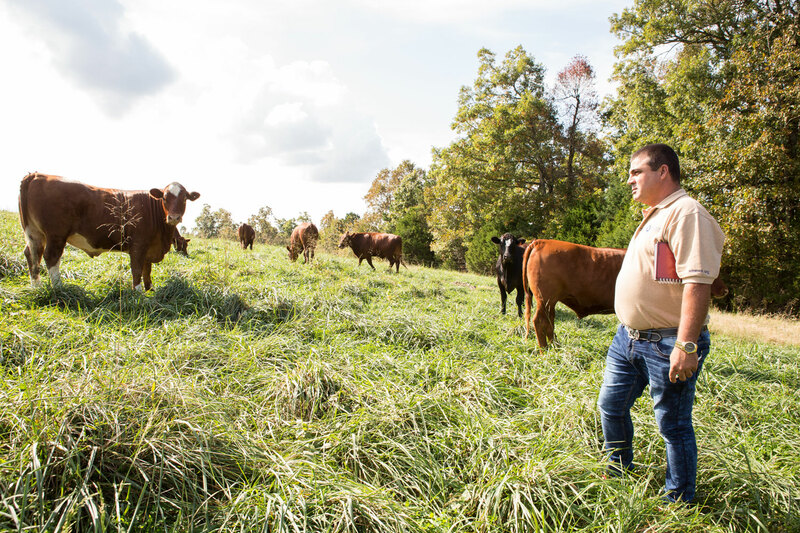 Back home, Hopkins and his wife founded Falling Sky Farm, a 250-acre sustainable operation that raises cattle, hogs, chicken and turkey on a rolling plot of grassland and forest sufficiently remote that Google maps can’t quite pinpoint it. Jelis, by contrast, lives over a thousand miles south of Arkansas in Pinar del Rio, the westernmost province in Cuba, where he is president of a farmers’ cooperative that produces everything from pork to 42 types of fruit to building materials to help community members construct houses. The apparent gulf between Hopkins and Jelis also includes a language barrier. But to watch the two men interact on a trailer festooned with hay bale seats as it bumps across Falling Sky Farm on a cloudless October day is to understand why the bond between farmers is far stronger than any geographic, cultural, political or even linguistic barrier. Indeed, Jelis listens intently (with an assist from a translator) and scribbles notes as Hopkins talks turkey — literally, as in how much and what type of feed his turkeys need to eat to grow quickly, the vital importance of how they’re treated when they’re young and why he moves them to a new patch of land each day. When Hopkins finishes his explanation, Jelis looks up from his notebook, smiles and slaps his host on the shoulder. “Got it,” he declares. Angel Luis Michell Pellicier, who heads up the Cuban Association of Farmers and Forestry Technicians in Santiago de Cuba Province, was impressed with how the University of Arkansas Cooperative Extension Service works directly with farmers. Photo by Rett Peek. 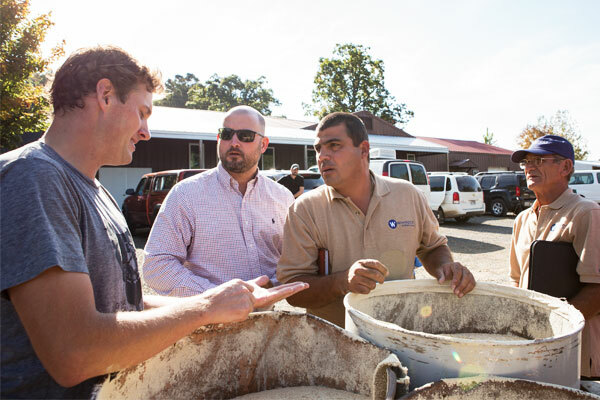 Exchanges like this were repeated almost continuously over the course of five October days in Arkansas, as a delegation of four Cuban farmers got an up-close look at how one of America’s most productive agricultural states functions. A year in the making, the tour was sponsored and facilitated by Winrock International. And although the exchanges were dominated by enthusiastic talk about topics of everyday practicality to farmers everywhere — irrigation, profit margins, techniques and technologies to improve production — the tour was both profound and historic. It marked the first official agricultural exchange tour by Cuban farmers to the United States in over 50 years. It was also an extension of Winrock’s recent efforts to engage with Cuba’s agriculture sector to address economic growth and food security concerns and opportunities. In March of 2015 Winrock staff and volunteer experts visited Cuba to learn about the nation’s agroecology, especially urban farming, and the desire among farmers to develop a national organic certification system. In March of this year Winrock and the Winthrop Rockefeller Institute gathered leaders from both nations at Petit Jean Mountain in Morrilton, Arkansas for the Cuba Consortium Agriculture and Food Roundtable, a high-level discussion of issues ranging from human rights to the prospects of lifting the longtime American trade embargo to allow potential cooperation in agriculture. Cody Hopkins of Falling Sky Farms discusses feed through translator Seth White with Yurien Bec Jelis and Lupe Anacario Lopez Sosa. Photo by Rett Peek. 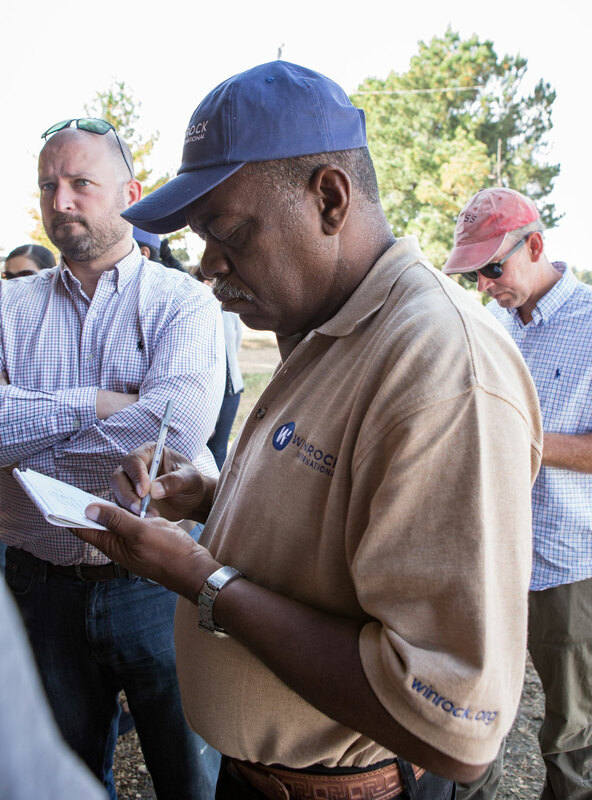 That two-way flow of information was apparent at stop after stop on the tour, which included visits to small and large farms, farmers’ cooperatives, the University of Arkansas Cooperative Extension and Arkansas-based retailer Walmart. 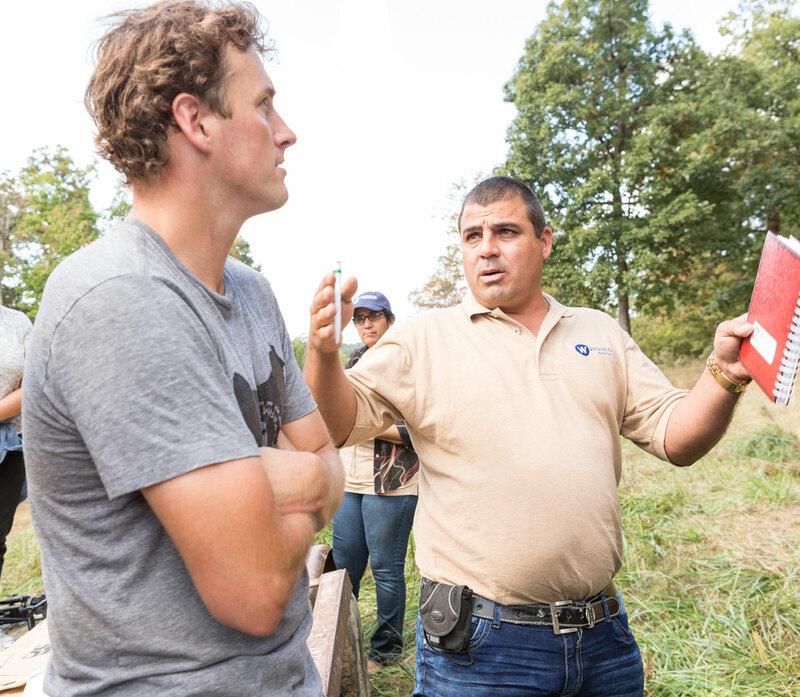 At the organic 5 Acre Farm in Pleasant Plains, Arkansas, the Cubans walked through rows of carrots, spinach and arugula and peppered farmer Brandon Gordon with questions. After a demonstration of the tool Gordon uses to seed his beds, Jelis explained that many Cuban farmers spread seeds manually (and also jokingly wondered if the tool would fit in his luggage). Later, after examining a bed of lettuce, Jelis animatedly described why he thinks Gordon would be well-served by planting onions next to the greens to help reduce damage from pests and to make his small plot of land more productive. Yurien Bec Jelis is president of a farmers’ cooperative in Pinar del Rio, Cuba. Photo by Rett Peek. Beyond all the practical discussions, though, Pellicier believes the trip also served a more fundamental purpose. “I think that there should be a brotherhood among farmers of all countries because in the end we are after a common goal, which is feeding the population,” he says. Here’s proof that the brotherhood between Cuban and American farmers is stronger now than it was before the tour started: By day three of the visit, Jelis had handed out all of his business cards. Winrock’s DeAnn McGrew facilitates a panel at the Arkansas Regional Innovation Hub. Angel Luis Michell Pellicier, Yurien Bec Jelis, Lupe Anacario Lopez Sosa and Onelvis Barrero Hidalgo share their experiences at the close of the tour. Photo by Nelson Chenault.